This service will be activated for all UiT employees’ Office 365 services on 13 June 2018. Note that this includes accessing your UiT email. Two-factor authentication is when you log in to a service with a username and password (something you know) in addition to being called, receiving an SMS, or confirming the login in an authentication app (something you have). In Norway the most common kinds of two-factor authentication are BankID and MinID. Two-factor authentication increases security dramatically. Even if a hacker gets your password they will not be able to access your account without your smart phone. This is one of the steps UiT is taking to protect your privacy and information security. The two-factor service will automatically notify you based on your chosen primary method for receieving notifications when you log inn. If you have chosen to be notified on SMS to a designated phone number, the SMS will be sent automaticly after you logged on with your user name and password. All you have to do is to type inn the code and proceed. You can also choose alternate ways to receieve your access code. If you normaly use SMS, but forgot your phone at home, you can choose "Sign in another way" and choose to be called up on your work phone number (This requires you to set up an alternate phone number on the two-factor setup page. See bullet 3. below). Software on your computer will normally remember that you have gone through the two-factor authentication process with them. However, there might be situations where e.g. Outlook asks for authentication again. If you use a different computer or mobile phone, you will be asked for two-factor authentication the first time you want to use email or Office 365 on that device. 3.a. 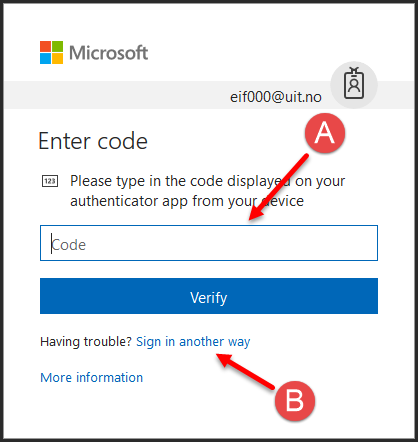 Change authentication method to "Microsoft Authenticator"
This guide shows you how to change authentication method to "Microsoft Authenticator" if your previously choose something else. Microsoft Authenticator is an app you can install on your smartphone that lets you log in with two-factor authentication. It lets you use a code or directly approve the login. If you input your work phone number (either office phone or a mobile phone number that UiT pays for), Microsoft can call you to approve a two-factor authentication. 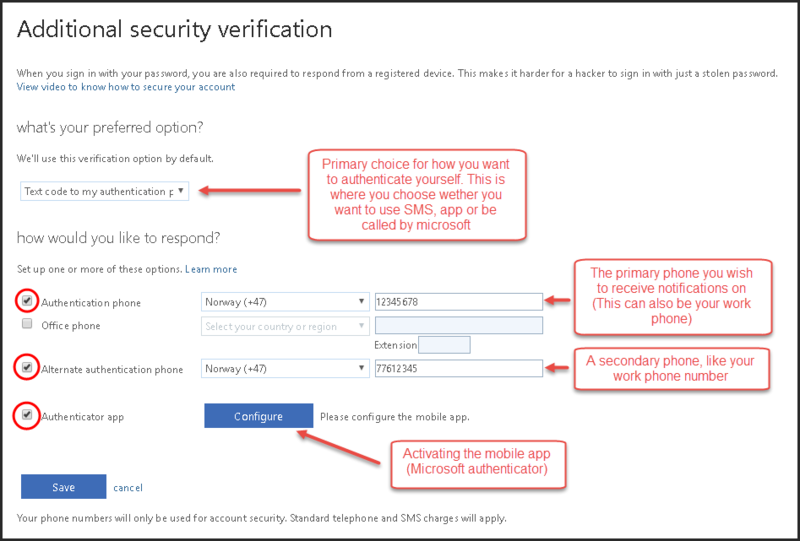 This tutorial assumes that you have set up two-factor authentication with SMS as described above. Primary authentication phone: Type inn your work number in the field "Authentication phone". (Optional: If you also choose "Call my authentication phone number" as preferred option, Microsoft will call your work phone every time you need the two-factor authentication to log inn). In this user guide you will learn how to install the Outlook app with two-factor authentication activated. Which services are protected with two-factor authentication? All Office 365 services, including email. A full list of these services can be found on the Office 365 webpage.